History has been cruel to Central America. Ever since Colón made the fateful decision to sail westward from Jamaica during his final voyage, the region has been subjected to enslavement, disease, extermination and exploitation at the hands of both foreign and local conquerors alike — from the homicidal Hernán Cortés and the Nashville native who made himself president of Nicaragua in 1856, to the banana republics of the United Fruit Company and the toppling of Honduras’ government in 2009. Today the so-called “Northern Triangle” nations of Guatemala, Honduras and El Salvador are considered the most blood-soaked area in the world, and for good reason. In the last few years no less than 50,000 people have been slain. Murder regularly goes unpunished because the murderers are rarely found. High demand for illegal narcotics in the United States combined with faltering economies and corrupt governments make Central America a hotbed of violent crime, which is why nearly 70,000 Central American children appeared at the U.S.-Mexico border last year seeking refuge. Of course little has changed since last year, and we can expect another tens of thousands to attempt the dangerous trek this summer. Given all that typically goes wrong in Central America, it’s easy to slip into an entrenched pessimism and consider the region a lost cause. Even a centroamericano American like me who follows developments in the region finds himself flinching instinctively whenever ever he catches the name of one of the countries in a mainstream headline. So imagine my excitement when I learned about Debra Gittler and the work she’s doing with ConTextos, a group committed to teaching Salvadorans to not only read, but also engage with what they’re reading. For Debra, the road to Central America began in Chicago’s Hyde Park neighborhood, where she grew up and first learned to love books. From there she studied at the University of Michigan, and after graduating with a degree in International Community Development, she worked as a bilingual teacher at the Author’s Academy in the Bronx. Though she enjoyed the work she was doing, she wanted to do more. It was only a few months into her time in Honduras when she caught the attention of education reformers working with another independent non-profit in nearby El Salvador. They asked her to head a literacy program there, and again she jumped at the opportunity to learn more and do more. In El Salvador she coordinated with groups like USAID and others to secure funding for her work. But soon she became disheartened by failings in the region’s education reform system. “We were basically counting how many teachers were trained, how many kids read. We knew the work wasn’t making any significant change, considering the amount of money being spent,” she explains. Debra also suspects that her being a “gringa” and “extranjera” didn’t go over too well with some of the locals, many of whom she felt either questioned her motives or were simply offended by her very presence. Her spirits low, Debra left El Salvador in 2009 and entered Harvard’s Graduate School of Education, certain she’d given up working in international development for good. But despite her experiences in Central America, she remained committed to education reform. She still wanted to work with poor kids; she just didn’t know where or what capacity. After all, becoming part of the United States’ own education reform system didn’t seem any more rewarding than in Central America, and Debra wasn’t eager to work with charter schools or Teach for America. Ultimately she felt Central America calling her back. “You became so aware of how many people like me were working on education reform in Chicago,” she recalls. “And even though there’s so much need, down [in Central America] there’s really no one else doing this work. So it seems like an obvious way to really participate. At Harvard Debra helped organize Learning Through Libraries, a project which saw books shipped to El Salvador for the purpose of establishing three libraries. She used her connections in the region and got El Salvador’s national airline to ship the books for free. Yet, again, Debra struggled with same issue that had plagued her before — effectiveness. Debra wanted to see people in places like El Salvador learn to have such conversations with each other, but she realized that no matter how many books she flew down, people wouldn’t be able to think critically if they couldn’t engage with what they read. So upon graduating in 2010 she founded ConTextos. The name is a play on words, underscoring the group’s mission to supply kids and their parents not only with books, but with the ability to read and understand them. “We didn’t even have an office,” adds Zoila Recinos from just off-camera. Zoila is coordinator for teacher training and a born and bred salvadoreña. To fully appreciate what it is ConTextos does and how tough those early years were, you have to understand exactly what Debra and the gang were up against. Throughout much of the region, simply reading to small children is considered pointless, given that they can’t even read to begin with. So the path to literacy in places like El Salvador begins with kids repeating vowel sounds — “me, ma, may, mo, moo” — and then moves on to combining sounds. Debra calls it “the Bart Simpson style of learning,” where kids are taught to read and write through intense repetition. Instead of challenging each student, teachers normally pose a question to the entire class and have every student answer at the same time. “It’s obviously such a completely backward way of developing language skills,” Debra says. ConTextos first tries to create a culture of real engagement between student and teacher in which kids are encouraged to ask questions. 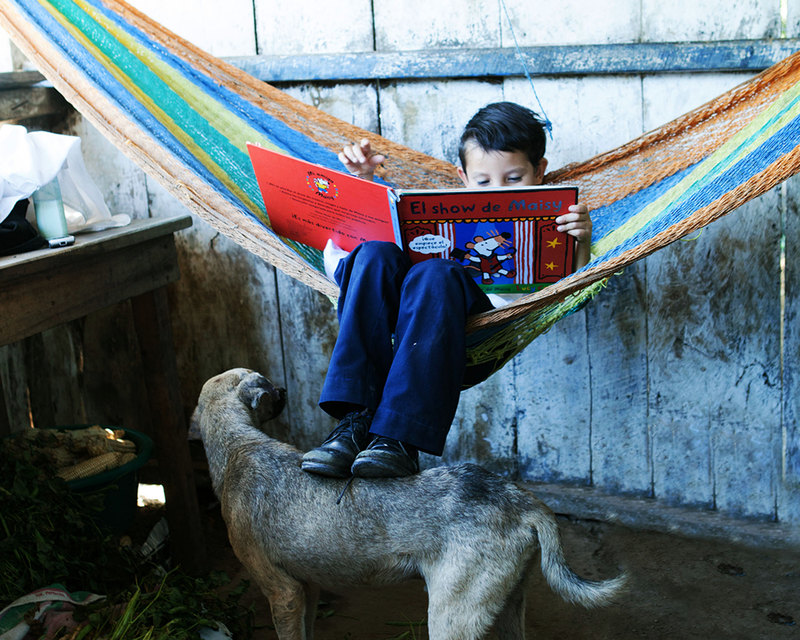 Of course an illiterate child will eventually grow to be an illiterate adult, so ConTextos also works to raise literacy rates among parents and even teachers, nearly all of whom have never read aloud to a classroom before and have trouble reading themselves. Debra says her group even has to show adults how to turn the pages. 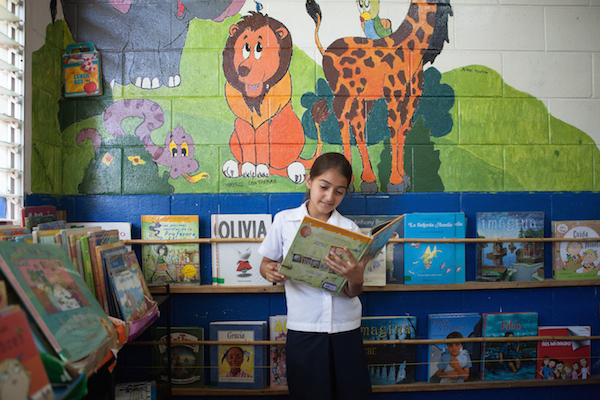 The money and effort that goes into simply buying a book on the local market makes books all the more valuable in Central America, to the point that schools lock up whatever books they do purchase to keep them from getting damaged. And when the students are allowed to take books home, their parents confiscate the texts for safekeeping until the time comes to return them. Despite all the challenges, the results of ConTextos approach have been promising. Discussing the lack of education and opportunity in Central America, the issue of gang violence is inevitably raised. While solid figures are hard to come by in a region plagued by dysfunctional governments, neighboring Honduras is believed to have the highest murder rate not only in the region, but also in the entire world. And El Salvador isn’t far behind. Last year El Salvador recorded nearly 4,000 murders. With a population of 6.1 million, that’s about 69 killings for every 100,000 salvadoreños — a 57 percent increase from the previous year. Some analysts have argued the rise in violence resulted from the collapse of a gang truce started in 2012. Most, however, agree that the truce merely allowed gangs like MS-13 and Barrio 18 to grow, and that the recent uptick is due to the now emboldened gangs warring amongst themselves in efforts to expand their empires. Debra admits that having an American passport allows her to feel much safer in Central America than the locals do. Having started nearly 10 years ago, she isn’t sure if conditions have improved in Central America during her time there, or whether she’s simply grown accustomed to the insecurity. “The other thing is that the violence is so bad here that people are just exhausted,” she adds. Still, a lot of the locals tell her the situation is getting worse. That belief may be what drove so many unaccompanied children to travel all the way to the U.S.-Mexico border last year, and why so many are expected to make the same journey again this year. “The problem is not that they’re arriving at the border,” Debra says. “The problem is that they feel the need to flee. And so while education certainly isn’t going to fix everything, it’s not going to get fixed if there’s not a major investment in education. Debra readily points out that, due to long-lasting systemic faults, Central Americans have felt the need to flee the region for years, even decades. And it isn’t the poorest of the poor venturing north, since it isn’t the poorest of the poor who can afford the trek. It’s only those with means who are able to escape the violence and search for opportunities elsewhere. “I’ve heard they’re strengthening the security by literally having security guards along the way so they can catch people before they get to the States,” she says, referring to the Mexican government’s clamp down on the border with Guatemala and increased patrols along La Bestia, the infamous “train of death” which carries many migrants through Mexico on their journey northward. Ten years into her work, Debra is still annoyed by how little her fellow Chicagoans seem to care about the plight of the developing world, specifically Central America. She thinks people back home falsely believe caring locally and globally is an either-or decision, and that ultimately fail to recognize the thread connecting the two worlds. “Chicagoans say, ‘What about the West Side? We need libraries on the West Side too,’” she tells me. “But when you talk about what needs to be done on the West or South Side, what Chicago looks like and what need looks like [in Central America], and what a small investment can do, it’s just two different worlds. The notion that we can and must serve our fellow human beings — whether they live next door, across town or halfway around the world — forms the foundation for Debra’s social entrepreneurship and is the driving force behind ConTextos, which continues to view itself as a Chicago-based non-profit. Chicago, city at the center of the U.S. immigrant rights movement, should understand more than any other how the lack of opportunity and security in another part of the world brings a sea of dreamseekers to America’s doorstep. As the son of a Honduran immigrant myself, I know few people willingly leave their homeland to begin life anew in a foreign place. Had there been enough opportunity and prosperity to go around in Honduras, my grandmother would’ve raised her daughters in Tegucigalpa just as happily as she did in Humboldt Park. But the patria, though rich in beauty and culture, lacked a lot of everything else. So my grandmother decided to try her luck in America — a decision thousands of her countrymen will make this year, and thousands more wish they could make. Plus, no matter how destitute the people of Central America may be when compared to the people of Chicago, Central America is still part of the Western world and has benefited somewhat from its close proximity to the United States. For that reason Debra says it’s hard to find enough donors, since many people look to optimize their satisfaction by donating to places that are known to be extremely poor. Undaunted, ConTextos continues to move forward with its mission. This year they plan to launch digital reading programs utilizing e-readers and tablets, which Debra believes hold great potential for the future of ConTextos. First of all they’re small, keeping students from becoming victims of violent theft that could cost them their lives. Plus tablets and e-readers allow ConTextos to expand its reach. And scaling throughout the region is exactly what Debra and her team intend to do. At the moment they’re eyeing Honduras, a country arguably racked with even more problems than El Salvador. “We would really like to grow into Honduras because Honduras is in so much need right now. What’s happened to Honduras in a short time, it’s really devastating,” she says. I’m not sure whether she’s referring to the hurricane that Honduras has yet to fully recover from, the 2009 coup that left a repressive regime in its wake, or the drug gangs that have made Honduras the distribution hub for narcotics making their way to an insatiable U.S. market. ConTextos is also working in El Salvador’s prisons and is moving into its juvenile justice system. Recently they trained 24 prisoners in literacy by helping them write and publish their own children’s books. The inmates drew on their own past experiences to warn kids against entering a life of crime and violence. For Debra, this demonstrates how literacy can be a tool for violence prevention. At the end of the day though, as with most noble endeavors, Debra is forever seeking donors to fund ConTextos’ mission. “We have a highly replicable program,” she says. “So it’s about finding the right kind of donors. And that’s where, again, being small countries with limited representation [makes things difficult]. In a bitter twist, Central America is constantly flooded with American dollars. But instead of funding projects like Debra’s and others, the U.S. government continues to spend hundreds of millions on funding military-police forces, and the American public’s demand for narcotics fuels a drug war being fought in towns across Central America. Rather than instituting a “Plan Central America” or deepening the Central American Free Trade Agreement — which pretends to raise the regional economies while it quietly exploits them — the United States should commit itself to providing the people of the developing world with the tools for their own uplift. Because in an increasingly interconnected world, where political and economic instability in one country poses a threat to political and economic instability everywhere, making sure people (especially our neighbors) have the tools and opportunities to lead full and healthy lives is only in the best interests of the United States. And I agree with Debra when she insists that education is the crucial first step to a better life. Visit ConTextos.org to learn how you can help.